Preparing for a bar or bat mitzvah? Consider a Mitzvah Project to support the Beber Camp Annual Fund and help ensure that no camper is denied a summer experience at Beber due to financial need. For David’s Bar Mitzvah Project, he chose to support Beber Camp’s Scholarship Fund by hosting a basketball tournament. He charged a fee for participation as well as snacks, and all the money raised went to Beber Camp. 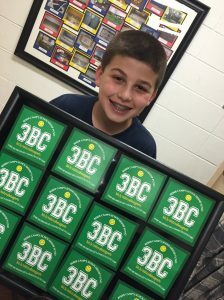 Louie raised money for Beber’s Scholarship Fund through selling Louie’s MItzvah Mandelbread. He sold chocolate chip and pistachio flavors. Louie loves cooking and wanted to support Beber while doing one of his favorite activities.